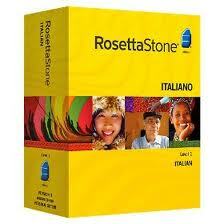 "Good to build up the Italian foundation for beginners." Rosetta Stone Italian is part of a language learning software series used by more than 5 million people from 150 countries. Aside from private individual users it is also used by companies, government and military agencies, and schools. The latest edition is Version 4 TOTALe, which beside the standard course found in the earlier versions now includes additional programs like Rosetta Studio, Rosetta World, and the TOTALe Mobile Companion. Rosetta Studio has native Italian speaker tutors in a live online setting while Rosetta World is a social gaming application. Both make learning the Italian language even more enjoyable and easier and add to the versatility of this Italian learning program. The TOTALe Mobile Companion is an application that enables you to use the lessons on your iPhone or IPod Touch. A big downside of this program is the fact that it doesn't teach a single grammar rule or give a list of words from vocabulary to memorize, but creates an immersion environment which forces you to learn by associating images with words, just like a child learning language for the first time. This makes the learning process more intuitive and increases chance of retention. The software has a rather simple, easy to navigate layout and individual lesson modules focusing on different skills accessed from the main menu. The program has very intuitive lessons that I didn't even have to use the tutorial for. Aside from the tutorial, the publishers, Fairfield Language Technologies, offer customer service support by phone or e-mail. The website also has an FAQ page regarding navigation and other basic problems. This program might not have as many tools as others, but uses the tools it has to the fullest extent. The publishers took out a lot of features found in other language programs, reduced the learning process to the necessities, and have come up with a product that works well. Still, because of this lack of more word tools I don't have it at the top of my list. The other notable shortcomings of this course in previous editions included lack of cultural sensitivity, which in TOTALe has been improved. The pictures in the latest version now closely reflect the culture of the language that is being taught. The program is good to learn nouns through matching pictures with words, but is harder to learn from the syntactic and grammatical perspective. The vocabulary used can also be more formal than what is commonly used by native Italian speakers. Good interactive emphasis on the learning process. Sometimes not teaching useful phrases. Expensive ($299 USD for all 5 levels). Using a very simple picture-word association method, Rosetta Stone Italian tries to make learning the language as simple as possible. The software doesn't have the same amount of audio lessons as the competition, but works well on an interactive level, which makes it effective to teach kids as well. The basic course is good for building up the foundation for beginners. The whole course is very expensive. That's why I can't recommend it to learners on a tight budget. Compared to other software titles reviewed on this site it offers less value for money and fewer features at a higher price tag.